I made a trip back to Baltimore last month to commemorate the 20th anniversary of meeting Dan. I recorded my memories of the experience in my Day One diary, and wanted to share some excerpts. I called every number I could find for C.O.I.L. 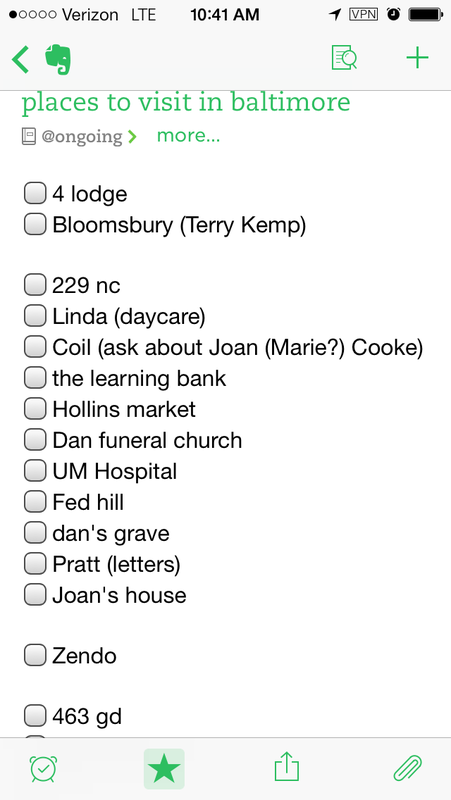 and The Learning Bank this morning, and they were all disconnected or reassigned to new owners. I sent a letter to the C.O.I.L. office just over a year ago. It never came back, but I had no reply. Sent a letter to the house over a month ago, with the same result. Judy Bushong helped me find the current owner of the house, apparently an absentee landlord in Salisbury. I sent a letter there overnight, will see if the phone rings. It looks like I’m just going to be knocking on doors Thursday and seeing what happens. Maybe it’s been long enough that every trace is fading away. Maybe I’ll be Silas Marner returning to Lantern Yard. I finished listening to A Single Man tonight, and don’t want to dilute it with podcasts, so I’m listening to music while I wash the dishes, finding recordings I had when Dan and I were together. Through the miracles of the modern world, a moment’s search on Spotify, a glance at CD covers, and the tap of a finger give me the exact Lou Harrison album of Christmas 1994. I’m sitting in the chair by the front window while it plays, watching the snow fall on Carey Street and overdosing on the giant canister of green mint M&Ms someone’s given us, while my wonderful love sleeps in the bedroom, and I’m fully aware that I’m by far the luckiest creature on the face of the earth. [10:40] Learning an anchor we used to watch on WJZ was 1 of the first to get married when law passed, to a reporter at the station. Wonderful world. Well, dear, here we go. After the long (for me) drive and a late dinner with Ron, I didn’t set an alarm, and we made a slow start to the day. I didn’t arrive in Catonsville until 11 o’clock. The Lodge Road house appears to have been bought by a family with children. They’ve done a little landscaping and added a patio in the backyard, but it’s otherwise as I left it. I Tweeted a photo to Steve, who shared my dismay over their inexplicable walling in of the sunroom. [11:31] Estimating 10 memories per block. As I drove through the neighborhoods, I found my index finger working overtime, pointing at this, and that, and behind to the other, and gesturing over the hill to where yet another place slotted into my mind’s map. I was amazed at just how many memories I have around there. I forget that Catonsville encompasses so many phases in my life, pre- and post-Dan, pre- and post-Glenn, from music days to freshmeat co-workers. From a distance, I can see the major landmarks, but being there fills in dozens of little pieces and people and events which go with them. After stopping to establish the atmosphere with a cup of Royal Farms coffee, I pulled into the parking lot of the old high school and looked across at the house where I was renting the basement when I met Dan. The yard looked like a bazaar, so I thought that either Terry still lived there and was still running the never-ending yard sale, or the new owners had kept up the tradition. When I knocked, a man answered and told me Terry Kemp still lived there and was his wife (Terry Sann, as I later learned). We spoke for a few minutes and I gave him my contact information for Terry. Then, as I turned to leave, Terry pulled into the driveway. She got out, crooked her head to one side and said, “Is that Jeff?” We hugged and went in and talked for an hour. We sat in what was my kitchen. Terry and her husband Kenny moved to the first floor after he had surgery to put metal plates in his back. I told her about the reason for my trip. She remembered Dan from when he’d meet me at my place. I’d forgotten that she’s one of those ever-rarer people who laid eyes on Dan, even if she didn’t know him well. The boyfriend I knew is gone, and Terry and Kenny have been married 13 years. Her daughter Melia did well at Towson University and is a birthing nurse in New Freedom, Pennsylvania. Terry’s been unemployed for two years after teaching music in schools, and hustles at this and that, as ever. Kenny works as a mechanic, and the two of them sell fish from their property on the Eastern Shore (she also has land in Romney, where Flossy and Rick have their campsite). Terry sold tomatoes from the stand in the front yard, and they were so popular that people would get her out of bed to see if she had any more. Now the stand holds miscellaneous bric-a-brac, sold on the honor system. Scattered around the house are many terrific watercolors Terry’s painted and has been selling at art shows. She’s finishing a Master’s Degree in music education, but always has a dozen schemes to fall back on if nothing comes of it. She’ll always be a survivor. I left her and took a walk to soak up the old neighborhood and loosen my neck. I stopped and had a smoothie at a hippie pizza place now occupying the space which used to be the dance studio where I took my first Tai Chi lessons. The other end of the building used to house the store where I bought supplies for Dan when he started saying Mass again. Beyond that, the soccer fields and the tree under which I used to sit and read. I headed down Frederick Road intending to recreate my first drive to Dan’s house, but realized halfway that I was on the wrong side of Loudon Park Cemetery. I must have gone straight from campus to our first date. Was I working at the library that night? I remember I used to use the phone in the staff lounge to check my City Paper voicemail for replies to my personal ad. I wonder if that’s where I first heard your voice. Do you remember what you said? You wanted me to know you were still vital despite your age, and said you’d been hiking in Patapsco State Park the weekend before. You later added the detail that a group of Cub Scouts appeared behind you, and you overexerted yourself hurrying up the ridge trail because you weren’t going to let them pass you. I crossed over to Wilkens Avenue to get back on track, and realized I was going past Rheb’s Candy Company. I turned down the alley, and there it was, same as ever. I went in and hunted among the displays for our old standbys, the truffles coated in sprinkles, and they were just bringing out fresh trays of them. How many of those boxes did we go through? We never made a trip without one riding on the seat between us. I remember when we gave one to Marie, and it was so rich she nearly choked. I had them fill a box of assorted chocolates for me and Ron, and another for Flossy. When I told them she was from the Pittsburgh area, home of Baltimore’s football nemesis, they added a piece covered in purple sprinkles for the Ravens. I finished driving on the proper course, noticing that the narrative was getting ahead of itself when I passed the funeral home on Pratt Street. Things looked much the same when I pulled up on our block, except that a park had been created where the houses across the street had burned down, with two murals on the still-standing buildings. I was surprised to see St. Luke’s still in operation. I took a deep breath and started toward the door, but didn’t get to make my knock. It opened as I approached, and a young man was coming out. He was a polite young fellow, and interested when I said I’d lived there 20 years before. He said he and his family had only been there for a month, so they wouldn’t have gotten the letter I sent to the house a few months before. He guessed I was hoping to go inside, but his mother was out and he was home alone with his sister, so he couldn’t let me in. He sped off with a friend on a moped, and I knocked next door. Linda opened it, looking just the same, gold tooth still shining. She hung back, saying “Yes?”, until I told her who I was, and she laughed. She was wondering who this white boy was. She thought I was another of the gas and electric people, asking if she wanted to change her service. She’s doing well, still running her daycare. Her daughter went on to college, did very well there, and has a good career now. She says several of the old neighbors are still there. Sissy’s still on the corner, and several of her relatives about. She still remembers Catherine, who lived in her house before her. Catherine must have been in her 80s, and must have died shortly before Dan did, since I don’t remember her at his funeral, and I know Linda came soon after Dan was gone. Catherine was the grandmother to the whole neighborhood. She lived in that house when she was a child, then I believe moved to the Eastern Shore and came back in her old age. She remembered when the streets were lined with trees and no one locked their doors. There were benches on the sidewalk, and they would sleep out there on hot nights and no one would bother them. What changes she saw in a single lifetime. Linda said there hasn’t been a good neighbor in our house since I left. After Dan’s sister gave the house to her son, Howard, he did just a little work on it and moved in a woman who got into the drugs and gangs and got pregnant by one of the boys in the neighborhood. After she moved out, there was another tenant or two, then the house sat empty for years. Someone eventually stole the central air conditioning unit out of the backyard. A new owner recently bought it, did repairs, and has moved in a series of tenants who have all been disasters. She said it’s probably for the best that I didn’t get in the house, that I’d probably be depressed by the state of it. She may be right. I did note that our Venetian blinds are still in the second floor windows, now tattered and hung sideways, and I wondered what else of ours might still be in there, and what memories it might have provoked. I wished her and her daughter well, and let her get back to her kids. I took some photos of the house, still just the same except for a satellite dish screwed into the bricks. I walked around to the back and found the alley almost impassable. The whole neighborhood feels rougher, dirtier, and more run-down. The yard, once vibrant with Dan’s flowers, is sterile now. There are two large trees growing by the fence. I remembered Dan had cut wine casks in half, lined them up there, and filled them with plantings. I checked the base of the trees, and as I’d suspected, found they had grown around rusty, twisted bands, all that’s left of the long-rotted-away casks, and are remnants of Dan’s garden. I walked down the alley to the Agape House. It’s hard to imagine that the neighborhood was once prosperous enough to support a church like St. Luke’s, with such an imposing rectory and a fulltime staff. It looked empty, and a sign on the door said “No trespassing”. The street was much the same as before, just fallen deeper into disrepair, except that the lot on the opposite corner sported a long tent in the shape of a half-cylinder, with vegetables growing under it. My hopes rose when I saw the C.O.I.L. logo still in the window, but fell again when I got closer and saw the windows were covered with brown paper. There were four-to-five-year-old magazines laying in the windowsills, and a big stack of mail on the floor behind the letter slot. I pictured the letters I’d written to the office at the bottom of the pile. I asked two men on the street if they knew what had happened to C.O.I.L. One had just starting working for a property management company which owned several buildings on the block. He didn’t know anything about the C.O.I.L. building, but suggested that I walk down to his office and ask his boss. The man from the barber shop two doors down said C.O.I.L. had closed several years earlier. He didn’t know what had happened to it. I thanked them and said I’d go try at The Learning Bank, then try the landlord if I didn’t find out anything there. The building looked just the same as when C.O.I.L. opened it in 1995, but instead of saying “The Learning Bank of C.O.I.L.”, the sign over the door read “The Urban Business Center”. It was dark inside, and the lobby had furniture pushed up to the sides, stacked up and wrapped in paper. Three of the outer doors were locked. The fourth let me into the foyer, and when I tried one of the inner doors, a lady at a desk 15 feet away shouted, “Can I help you?” I shouted back that I was wondering what happened to The Learning Bank. She told me to wait a minute. When she came back with someone, she buzzed me in. Beyond the security desk where they were standing, the open stairwells showed three floors, clean and well-lighted, the basement full of neat rows of tables and the upper floors with classrooms ready for the evening’s students, a bright and cheerful contrast to the outside appearance. The lady who had come to see me was Stacy Smith. When I told her who I was and why I was there, we talked for over an hour. Stacy is the head of the organization currently running The Learning Bank building. C.O.I.L. didn’t exactly disappear, but evolved into a new group after a shakeup in 2005 during which they almost lost the building. They’re now supported entirely by the neighborhood and don’t seek grants or United Way funding. They still offer adult literacy classes and a variety of vocational courses. The doors were locked because they were rehabbing the lobby. The right side had a stand where some of the young people are going to work selling coffee and snacks, and both sides will be filled with chairs and tables and computers for people in the neighborhood to use to get on the Internet. The C.O.I.L. office building is going to be renovated into extra classroom space. She said that if my letters ever came, they must have gotten lost in the shuffle. The pile of mail I’d seen over there was just a small part of the stack of junk they scoop off the floor each week. She had been in the neighborhood for years before, but didn’t know Dan and hadn’t been involved with C.O.I.L. until her arrival there in 2005. She was curious to hear my memories of earlier days. She knew a lot of the people who’d been active then. We reminisced about Rita McCurley and Jim Caskey (who seems to live large in the local memory, although his savings and loan is gone). She didn’t know Joan Cooke, but reminded me of the Sisters Clair, Judith, and Mary Francis. She said Joyce Smith, who had worked out of the second floor of C.O.I.L. with the red-headed man who had run C.O.I.L. CEDC, was still in the neighborhood, and planted the garden under the tent I’d seen by the Agape House. She remembered when St. Luke’s Rectory had been “The Respite”, run by Catherine (not the Catherine who lived next to us). She said the Agape House closed. Only their catering business remains, and Reverend Robinson has moved it to another location. I asked her whether she thought anything of Dan’s might still be around. My memories of those days and the immediate aftermath are shaky, but I don’t remember cleaning out Dan’s office. I think we must have let the C.O.I.L. staff do it and return any personal belongings to us. I was particularly curious about the photo of Dan shaking hands with Barbara Bush which hung on the wall. To my delight, she said all of C.O.I.L.’s photos had been archived, and that students were going to be cataloging them and putting some on display in the lobby. She showed me a few which were already there of The Learning Bank over the years, including some of the original building across the street (which I noticed had been razed), but none had Dan in them. She said she’d be glad to have me come and help, and they might even interview me to record some of C.O.I.L.’s oral history. I can’t wait to see what pictures they may have of Dan. I thanked Stacy for letting me take up so much of her day, and headed back into the street. I took a stroll through Hollins Market and around a little bit of Sowebo, glad to see there were still little shops and cafes in the surrounding blocks. The Mexican restaurant was still there, the one where I met Joshin for lunch the day she asked me to take her side when the zendo was flying apart. I came back to C.O.I.L. and stood looking at the office for a very long time. A man came up on a bicycle and asked if I knew what this building was. I told him what Stacy had told me about the plans for it. I told him that it was the former C.O.I.L. offices and that my partner had been the executive director from 1978 to 1996, that I was back to visit because we had met 20 years ago, 20 years ago today. He was interested and sympathetic. He said he’d been in the neighborhood for 20 years and had taught at The Learning Bank. He’d been on the other side of the housecleaning when Stacy had come in after the turmoil of 2005. He wished me well and peddled off. I stood looking at the building for a long time again. A very, very long time. I could have stood there for days, years. Every feature of it reached back in my mind, and I saw so many memories. I imagined Dan so surprised and the staff delighted that first Valentine’s Day, when the florist walked in with a single rose in a vase for him. I remembered playing my Junior recital program for everyone on their lunch break. I remembered the nepotism of Dan hiring me to man the front desk, saying I could practice there, until I quickly annoyed the person in the front office. A man pulled up behind me in a pickup truck and asked if I knew what was happening with the building. I repeated Stacy’s news. When he thanked me and drove off, I saw the bicyclist at the end of the block, still watching me. I went back to the car for the trip’s great cathartic meltdown. [17:13] Wrapping up long day. Circling the block heading out of town, starting towards our house before I realize what I’m doing. Hello, old habit. I eventually said goodbye, circled the block, and started up Carey. Something dwelling deep at the bottom of my mind saw the pattern of houses stretching up to Franklin Square and said, “Oh, almost home.” A navigator laid in the route, and someone asked, “Will Dan be there?” Someone a little higher with access to memory answered, “No, of course Dan’s not there anymore.” Someone up top took in the Here and Now and cut in to say, “You idiots,” and I turned onto Baltimore Street. I drove a few blocks in to St. Peter’s. I looked at the steps down to the basement and thought of the times we’d carry all of the food and supplies in and out for The Day at the Races, C.O.I.L.’s periodic fundraiser, where people would bet on the outcome of what looked to be 8mm films of horse races from the ’70s. I always wondered a bit about the legality of this, but I guess it was all right for a 501(c)(3), like bingo for a church. It was Caskey’s pet project, as I recall. He promoted it because it was something people in the neighborhood would participate in. Dan didn’t think C.O.I.L. would be able to keep meeting its budget unless they also turned their focus to events which attracted the attention of people in wealthier parts of town who could make substantial donations. Fencing blocked the front sidewalk, except at a little opening where I went in and climbed the stairs. The interior was dark behind the workman who was pushing open the door as I approached. I could make out layers of scaffolding fading into the shadows. The one of the three workmen who spoke English said it was being completely renovated and it wasn’t safe for anyone to come in. I hadn’t been inside since the funeral, and had wondered if anything would look familiar. I later read that the diocese had sold the building to a Protestant congregation who were gutting and rebuilding it, so even if I had gotten in, I may have only seen it stripped bare. Maybe the windows would have prompted something. Probably not, since I was drifting through a fog when I was there. I do remember Father Roach talking about the years he’d worked with Dan and all he’d done for the community. I remember being surrounded by Barbara’s family, and Marie and Mike, and all the people from C.O.I.L. and the neighborhood and other organizations around the city. I remember getting into the Jeep and waiting for the hearse to pull out, Barbara getting overheated in the back, Mike saying it was bad for the car to run the air conditioner when it wasn’t moving, and me trying to convince him it was not an ordinary day. Only now do I remember that we must have come back here to the basement for the reception. C.O.I.L. organized it. Barbara and I had made all the other arrangements with Gary Kaufman, and would drive around settling the estate in the coming weeks. [18:08] Making last stop at E.R. Trying to ignore desire to tell strangers I’m not staggering because I’m drunk. I drove down to park the car at the corner of Pratt and MLK. The day was running much longer than I’d planned, and happily so. I’d prepared myself for the possibility of coming downtown, finding nothing and no one, and heading home, and had instead spent hours on end between Terry, Linda, Stacy, and assorted strangers. The city was producing intelligence as quickly as I could consume it, and I had to start deciding how much more of my plan I wanted to pursue. All I’d had since breakfast was the smoothie and a small red apple, and it was getting too late to eat and get to the zendo for evening service, as I’d hoped to do, so I called Ron and asked if he wanted to have dinner together instead. He went to work on it, and I walked over to the hospital. I headed back towards MLK, looking down Baltimore Street at what must have been the route I’d walked to C.O.I.L. that June day when the whole world was twisted through a funhouse mirror. I found myself standing still and staggering again, and decided I’d better head back to the car. I thought I’d still try to get to Federal Hill, to that bench where I’d sat that winter night with my arm around Dan, watching the city lights, but the rush hour traffic swept me along until the only real option was to get on 95 and take the tunnel out to Joan’s house. I found the street where she and her husband had lived when they’d had Dan and me to dinner. I tried a couple of houses with lights showing, but both of the occupants were new to the neighborhood and couldn’t tell me whether a Joan Cooke still lived on the block. One pointed me to the house of a longtime resident, but he didn’t answer the door. Two more people I stopped on the street couldn’t help either, so I consoled myself with knowing I’d tried. I went around the corner and sent Steve a photo of the old zendo, now a tax preparation business, and headed back to Ron’s. I stood in the alley and looked at the porch where we sat, looked up at the window of our bedroom. My God, dear, that house means nothing to those people. I arrived exhausted and high, grateful to take in some sustenance and talk about how the day had gone. So this is the morning when I was walking across campus and kept grinning and shaking my head in wonder at how bright the world had become. We spent another slow, easy morning before we said goodbye and I got on the road for Glen Burnie. I turned off the beltway to retrace the part of that original trip I’d missed the day before, filling in the gaps in my memory of Wilkens Avenue from UMBC to St. Agnes Hospital, with more people, more memories lining both sides of the street. I met the Kindred Spirits for lunch, glad to have created an excuse for the whole gang to come out. I guessed they hadn’t all been together for a while, since they spent an hour and a half talking, mostly about the church. Ruth, Jack, Cindy, Bob, and Dale all made it. Ruth had emailed me before the trip to tell me Millie had recently died, but I only got a moment to offer Dale my condolences. I’ll have to write him when I get a chance. It was great to see everyone. Glenn would have enjoyed it so much. I wished I had his gift for tossing oddball randomness into the conversation for all to share. We (almost) finished the box of chocolates Ron and I had only dented, and went our ways. I walked over to M&T Bank to close the checking account I opened in Annapolis in 1989, cutting my last practical tie to the area, then to Giant to pick up some flowers. [14:21] Offering to friends who swing other way the protip that carrying bunch of flowers around market is great way to get smile from every woman. I took a turn through Linthicum and pulled up on Glendale Avenue. An HVAC truck was in the driveway, and when the workman told the owner I was there, he came out to see me. From the sales records, I thought the house had changed hands again, but it was still owned by the same couple, the ones I’d missed meeting at the closing. He took me around the place to show me what he’d been doing with it, and I pointed out some quirks and oddities I wish I’d been able to share with him 18 months ago, especially regarding how to keep the sump pump working, which had been a minor disaster for him as it had been for us. He’s had to replace one thing after another, most recently the relatively new air conditioning system which no longer worked with the new furnace he had to put in because the old one started leaking gas. He’s redone the bathroom I had renovated to be handicapped-accessible for Glenn, and he’s started a war against the wilds of the backyard and the indestructible ivy, but mostly they’re just trying to wait out the money pit aspects of the old place until it gets stable enough to do the upgrades they want. They have a toddler daughter and a newborn son, and the house is a chaos of stuff piled everywhere. He’s doing the work himself and patiently getting through the necessities to find the time and money to make it into the home they want. In the meantime, they’re glad to be out of their condo and into a solidly-built house. He told me that Mr. and Mrs. Yi across the street have moved into a retirement community. They both had health problems, and Mrs. Yi was already on dialysis when Glenn died. I hated to hear they’ve left their home. They were always so busy working in the yard. I hope they found a place where they can still get outside and maybe do some gardening. I’ll have to drop Susan a line. He said two ladies bought the house and are living there now. It’s nice to think that maybe the balance of the street has been reestablished, and the gay household has just moved to the other side. 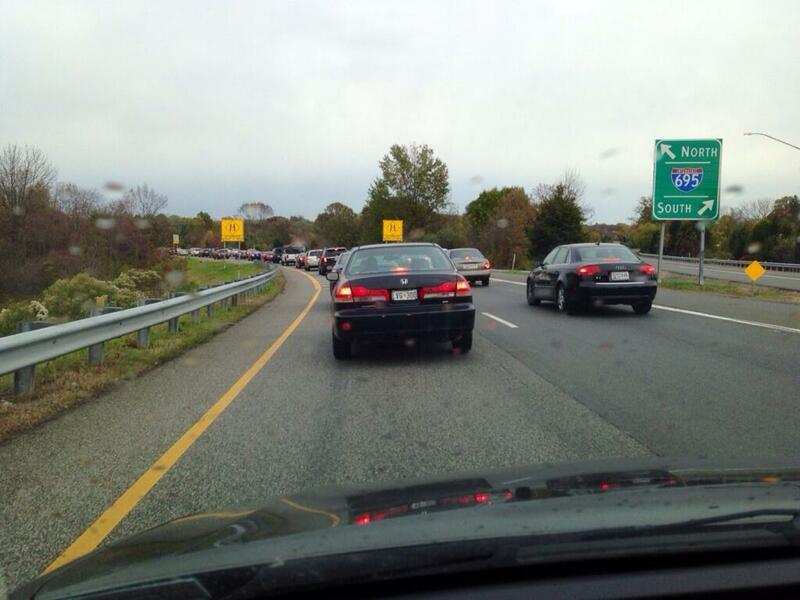 I took flowers down to Glenn, then hit a wall of stopped traffic across all the lanes of Route 50 in Annapolis. I got off and found it slow going, but luckily my memory of back streets was still intact, and I got to the low bridge over the river and bypassed the jam. Between the delays and the unexpected visit at the house, the day was again running long, and it was after 5:00 when I crossed the bay. I called Al and we decided to forget trying for dinner that night. I got some food and didn’t get to Mark and Charlotte’s until after 7:00. They were very gracious about getting company so late, and we ate and visited for a couple of hours. Mark, Dan’s nephew, was the first of Barbara’s family I’d seen since Howard came to get the keys to the house in 2001. Mark and Charlotte live in a trailer with four cats and a dog, and somehow miraculously keep it neat and cozy. They had a hard time for quite a while after Mark became sick, but have been doing well since his disability claim was approved and they received retroactive payments for their wait. They seemed very happy, just wished they were closer to the rest of the family. We talked about some of their memories of Dan. They said they never saw much of him when they lived in Glen Burnie, because he was such a workaholic. They said that they had understood that he was dying when he returned from California, possibly of liver cancer. I’d never heard that. I wonder what the real story was, since he lasted another 20 years (thank goodness, for us!). Talking about the Eastern Shore, Charlotte prompted my memories of all the day trips Dan and I made to lunch at The Town Dock in St. Michael’s. She said the only photos they had of the family were the ones from Barbara’s birthday party. I need to get around to asking Butch whether he has any I could help digitize and preserve and distribute to them and the rest of the clan. My neck and back were really questioning what was going on by this point, but I was so glad that they lasted for this last leg of the journey. I’d seen some people in Baltimore who remembered Dan a little, and some who could tell me what happened to his legacy, but it made the trip complete to have the chance to sit down with his flesh and blood. What luck to have tracked them down again! I thanked them for their indulgence, let them get to bed, and headed down to make my apologies to Al and tell him all that had happened. I woke with a combination of great regret at the idea of spending so little time with Al and misgivings about starting the six-hour drive home. I called Flossy. She was kind enough to take on another day of cat sitting duty, and Al and I slowed the pace for a relaxed weekend of R&R that I could barely bring myself to end the next day. [14:47] Finishing 1.5 hours of just compiling notes from the trip. So much writing ahead (so much driving first). Another eternity of standing with you, bending down to put my hand over the “iel”. Thank you for the wonderful anniversary, my love, and for all the years you’ve stayed with me. It wasn’t the way I’d hoped we’d celebrate it 20 years ago, but all day long, you kept sending people to say, “I’m here! I’m still here. I’ll always be here.” I’ll be here, too. Here’s to our next 20 and 200 and 2,000. [17:37] Feeling foolish to have thought we hadn’t made it to 20 years. How could we help it? Let’s go home.